Fiber Flux: Cold Weather Crochet by Marly Bird...Book Review and Giveaway! 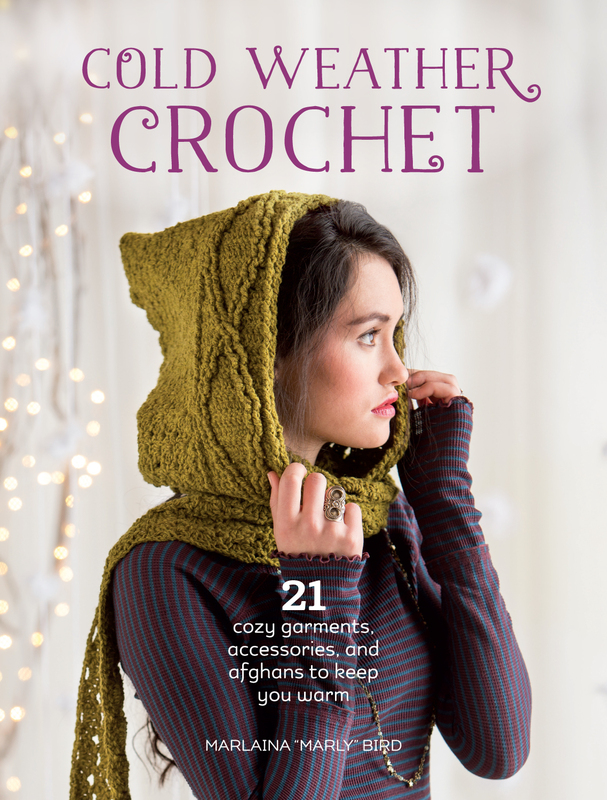 Cold Weather Crochet by Marly Bird...Book Review and Giveaway! I had the pleasure of reviewing Cold Weather Crochet by Marly Bird, full of cozy and colorful crochet projects! There are 21 project in all ranging from stylish hats, beautiful blankets, lovely slippers, fabulous scarves, and more! I love how there are so many different projects to choose from, catering to different skill levels. There is also a plethora of fun stitches to try too, like the Pretty In Pink Infinity Cowl seen below. Aren't those stripes lovely? One of my favorite projects in the book are the Thrummed Slippers. Thrumming is simply adding a small piece of unspun fleece/roving and stitching it right into the project every so often as you go. Thrumming is most commonly seen in mittens and items for the feet. It is super duper warm and luxurious to wear. This would be a great project to try this technique! I am a huge fan of color and this blanket is so happy and pretty! It is made using a log cabin pattern and it reminds me of a fabulous quilt! 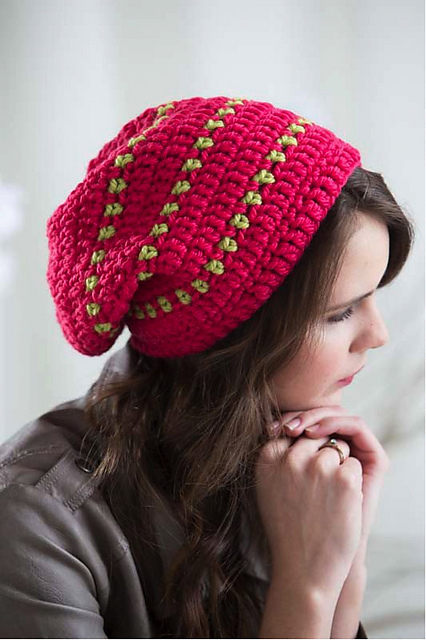 The Big Pink Hat (love the name by the way) is a perfect project in the book for beginners. I think it is great too for whipping up a few handmade gifts as well...make one in the recipient's favorite color! Love this book? Now is your chance to win a copy of your own! Special thanks to the good folks at Interweave F&W for sponsoring this giveaway. Thanks too to Marly Bird for authoring such a fantastic book for all of us to drool over!! Enter using the Rafflecopter widget below. Giveaway ends March 15 and is open worldwide. Void where prohibited. Now go, go, go and enter!! Oh, my--it's so hard to choose! I KNOW I'll make some slippers, though. I HATE cold feet! I would make the Pretty In Pink Infinity Cowl. I have never heard of thrumming before, so would love to try the slippers! And the log cabin blanket would definitely be a close second, it is so vibrant. I would make the slippers. I live in them at home and get through several pairs a year! I would make the log cabin afghan! The long cabin blanket, so gorgeous!! The Big PInk Hat. Very cute. Hard to say which I would make FIRST! I would make the slippers! I would love to make the slippers. They look so warm! Awesome! I would love to make the Pretty in Pink Infinity Cowl. Thanks for this chance! I had the chance to look through this amazing book and it would be so hard to choose which piece to do first, but I thin I would try the thrummed slippers. Thank you for the giveaway. Love your blog and would be thrilled to win this book..... I Adore the Pink hat... and could imagine making several for gifts for my daughters!!!! I'd make the infinity cowl and the big pink hat right away, but I'd have to make all if them! I'm think I would like to try to make some slippers. This book looks fantastic! There are many patterns I'd like to make, but I see myself starting with the Cross Creek Hat. I love the texture in it! I would make the chevron set first. There are many other things I would make in the book too. Like the African flower blanket#!! Thanks for the review and chance to win! I love the pink hat! Love the Pretty In Pink Infinity Cowl, beautiful. Fingers Crossed! I have been trying to win this book for months I hope this one is it? Love the great designs in it!! thank you for the chance to win it again!! The Shell Scarf. Beautiful colors. Let's see: I really like the afghan, slippers, the hat, and the cowl! Probably the whole Book !! The slouchie! Love The Big Pink Hat! I would love to try making the Thrummed slippers. I've never used this method, but it sound amazing. Definitely a hat as I always wear them from October to April to keep my ears warm!! I am very interesting in trying a project using the thrumming. I think doing that with slippers would be nice and warm. Thanks for the chance to win such a great book. I'd make one of the lovely blankets first. Looks like a fun book! I would start with the Big Pink Hat and then the cowl! The slippers look fab! I would make them first! I love Marly Bird! I would love to win this!!! I would totally make that log cabin blanket!! !